I fell over this hilarious thought experiment recently and thought I’d post on it as it touches on a couple of interesting topics: bike history and bike gearing. The big advancement ordinarys incorporated that put them miles ahead of their boneshaker predecessors was Eugene Meyer’s wire-spoke tension wheel. Lower weight and comfort – the boneshaker was instantly obsolete. The high-wheeler’s time at the top of the bike heap was brief – Meyer’s bike was introduced in 1869 and the first safety bicycle (what we think of when we say bike), the Rover, hit the pavement in 1885. In 1888 John Dunlop used pneumatic tires on a trike and the increased comfort for riders of small wheels was the high-wheel’s death warrant. Of course (because we are kooky primates), people still race Ordinarys – skip ahead to the 9 minute mark for actual racing action. And kudos to the small person wearing pink cowboy boots! Why the huge wheel? I’m sure you know this already, but in a word, SPEED. 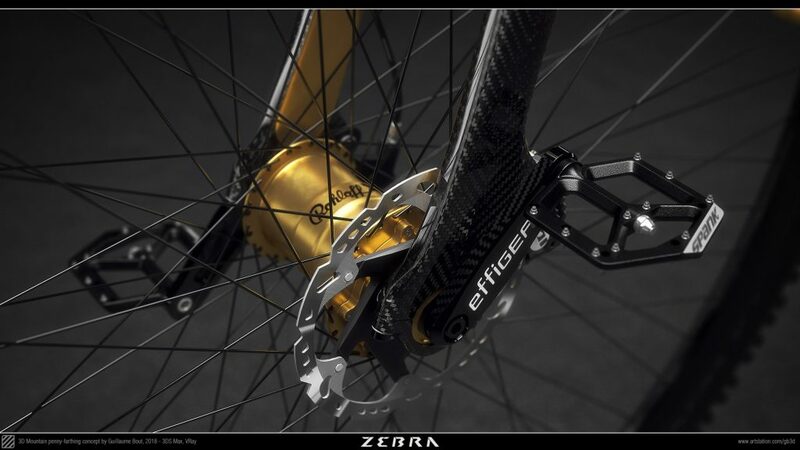 Ordinarys are direct drive – one pedal revolution equals one wheel revolution. If you want to cover more ground per spin, increase the diameter (and thus the circumference) of the wheel you are turning. Not satisfied with 1:1, Mr. Bout modeled a unicycle/Rohloff 14 speed hub mashup. At this point my smile became full on laughter. WHY? Why would you do this? The whole point of high-wheels is that the wheel defines the gear ratio!!?! 😀 But I got hold of myself – first, this is a modeling/illustration exercise so, really, who cares, and second, it gave me something to think about. 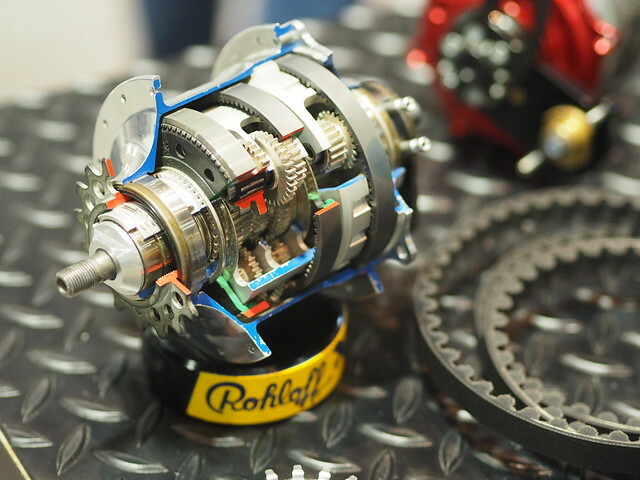 A weird blend of concentric unicycle Kris Holm hub and Rohloff speed hub with what would be huge bearings. Is this even possible ? I don’t know. The Effigear cranks are borrowed from my previous bikes, and shortened. To maintain optimum functionality and safety of the Speedhub, the lowest allowable gear combinations are 42/17, 38/16 or 36/15. These are the equivalent to a 22/32 combination on a conventional drivetrain. So, apparently, there’s a minimum amount of torque needed to run a Speedhub. Will this bike supply that? I’ll assume the wheel diameter is 52 inches (a not-unusual high-wheel size) and since it’s 1:1, that’s 52 gear-inches easy-peasey. Inputting a 27.5×3.0 wheel (Molly Fin’s), a 42 tooth chainwheel and a 17 tooth cog into Mr. Brown’s online calculator gives us 70.9 gear inches. 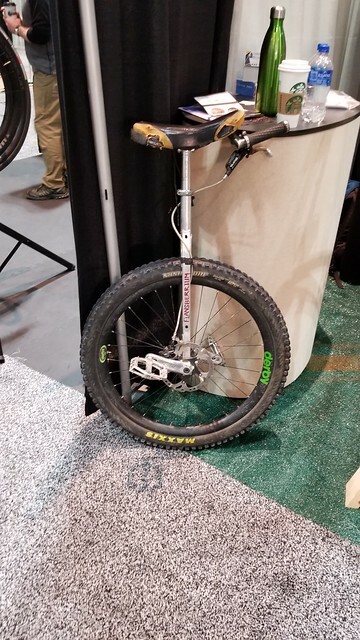 So, nope, wouldn’t work – or at the very least would void the warranty on a very expensive bit of German engineering (standard, that is to say, not ‘nonexistent unicycle-modified’, Rohloff hubs start at $1,300 and go up from there). Regardless, let’s press on! Again taking the same wheel and gearing setup, the calculator tells us that a Speedhub gives us a range of 19.8 / 22.4 / 25.5 / 29.0 / 32.9 / 37.4 / 42.5 / 48.3 / 54.8 / 62.4 / 70.9 / 80.4 / 91.5 /103.9 gear inches. Since 26 is half of 52, I plugged in a 26 inch wheel and 24 teeth on both the chainwheel and cog (1:1) and then doubled the result. This high-wheeler would have a range of 14.2 / 16.1 / 18.6 / 21.0 / 23.8 / 27.2 / 31.0 / 35.2 / 39.8 / 45.4 / 51.6 / 58.4 / 66.6 / 75.6 – that’s a really l-o-w set of gears. Appropriate, I guess, for trying to maneuver a huge wheel up and down trails. 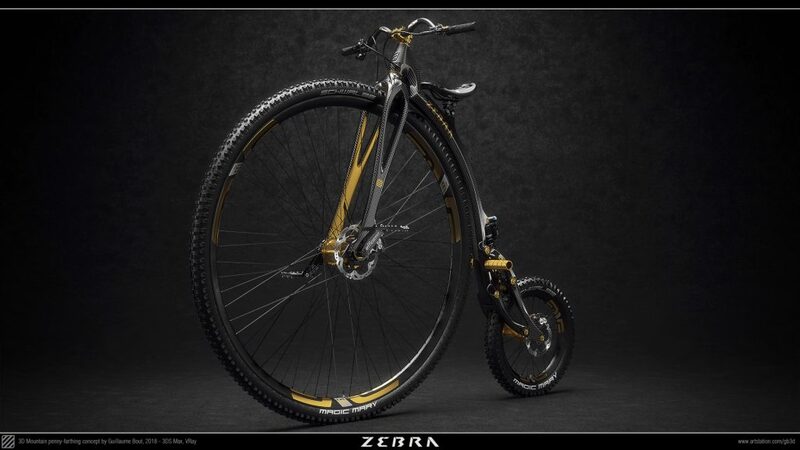 To get to equivalent safety bike gearing, just grow the wheel to 71 inches (and sign up a very tall rider) or, y’know, put a chain on it. Note: I think my gear reasoning is sound, but am open to correction. 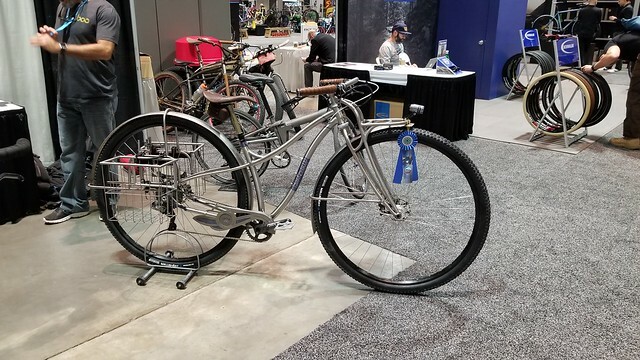 And I’ll end with a couple relevant photos from last winter’s North American Handmade Bike Show. This entry was posted in gearheadism by John P. Bookmark the permalink.